POS Groups are groupings of Concepts or POS Systems. POS Groups are exclusively used as a form of POS System Payment Type Separation and POS System Sales Account Separation. Separating Payment Types / Sales Accounts by POS Group is particularly useful for large organizations with multiple concepts. In place of managing several hundred Payment Types or Sales Accounts from across the entire organization, now Payment Types and Sales Accounts can be managed by Concept through POS Groups. POS Groups can only be created via 'quick add'. This is functionality that is common throughout Restaurant365 where the User enters values in a field then hits 'Enter' or 'Tab' and the System prompts the User if they want to create the Record. Navigate to the 'POS Integration Settings' tab of the Location Record. The 'POS Group' field should be visible below the 'POS Import Start' field. If 'POS Group' is not visible, please ensure that Step 1 was completed properly. 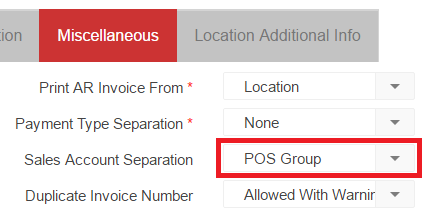 Begin typing the name of the desired POS Group in the 'POS Group' field. Click 'Enter' or 'Tab' when complete. A quick add prompt will appear asking the User 'Do you want to add new POS Group?'. Click the 'Yes' button to open the POS Group Add/Edit Form and save the POS Group. Add all desired POS Groups using this method at this time. Open each Location and update the 'POS Group' field with the desired POS Group that was created in Step 2. Save the Location Record. With the above settings in place POS Group Payment Type Separation / POS Group Sales Account Separation will function properly.